Digital Rights Management (DRM) is concerned with the ownership of digital information and access to that information. Organizations and individuals increasingly seek to prevent unauthorized or inadvertent release of owned, proprietary, or sensitive information. A variety of technologies are available to prevent the piracy and verify the true owners of digital content, unfortunately specifics of these technologies are often proprietary. Content can be protected by a variety of encryption techniques for the storage and transmission of digital information yet; these same techniques can limit access and usability of digital content. 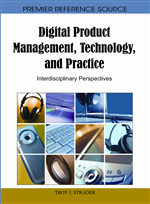 This chapter discusses the general state of digital security and technologies in use followed by a discussion of future directions for digital security research and practice. Digital media is replacing analog media as the primary technique in the way data or information is stored, transmitted, and used. The advantage of traditional analog information or other forms of traditional informational content (books, taped video, microfilm, records, etc.) is that it is relatively difficult and expensive to create high quality copies of the original materials. To this extent, traditional copyright law worked (Bates, 2008). As media shifted toward digital formats, the cost of reproduction declined and the capability to create exact high quality duplicates evolved. Under these circumstances, the protections given to authors under traditional copyright law begin to breakdown.